For the American company, see Transonic Combustion. The Sears–Haack body presents a cross-sectional area variation that minimises wave drag. 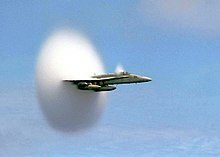 In aeronautics, transonic (or transsonic) flight is flying at or near the speed of sound 343 meters per second (1,235 km/h; 1,125 ft/s; 767 mph; 667 kn, at sea level under average conditions), relative to the air through which the vehicle is traveling. A typical convention used is to define transonic flight as speeds in the range of Mach 0.72 to 1.0 (965–1,235 km/h (600–767 mph) at sea level). This condition depends not only on the travel speed of the craft, but also on the temperature of the airflow in the vehicle's local environment. It is formally defined as the range of speeds between the critical Mach number, when some parts of the airflow over an air vehicle or airfoil are supersonic, and a higher speed, typically near Mach 1.2, when most of the airflow is supersonic. Between these speeds some of the airflow is supersonic, but a significant fraction is not. Most modern jet powered aircraft are engineered to operate at transonic air speeds. Transonic airspeeds see a rapid increase in drag from about Mach 0.8, and it is the fuel costs of the drag that typically limits the airspeed. Attempts to reduce wave drag can be seen on all high-speed aircraft. Most notable is the use of swept wings, but another common form is a wasp-waist fuselage as a side effect of the Whitcomb area rule. Severe instability can occur at transonic speeds. Shock waves can cause large-scale separation downstream, increasing drag and adding asymmetry and unsteadiness to the flow around the vehicle. Research has been done into weakening shock waves in transonic flight through the use of anti-shock bodies and supercritical airfoils. Transonic speeds can also occur at the tips of rotor blades of helicopters and aircraft. This puts severe, unequal stresses on the rotor blade and may lead to accidents if it occurs. It is one of the limiting factors of the size of rotors and the forward speeds of helicopters (as this speed is added to the forward-sweeping [leading] side of the rotor, possibly causing localized transonics). At transonic speeds supersonic expansion fans form intense low-pressure, low-temperature areas at various points around an aircraft. If the temperature drops below the dew point a visible cloud will form. These clouds remain with the aircraft as it travels. It is not necessary for the aircraft as a whole to reach supersonic speeds for these clouds to form. Typically, the tail of the aircraft will reach supersonic flight while the bow of the aircraft is still in subsonic flight. A bubble of supersonic expansion fans terminating by a wake shockwave surround the tail. As the aircraft continues to accelerate, the supersonic expansion fans will intensify and the wake shockwave will grow in size until infinity is reached, at which point the bow shockwave forms. This is Mach 1 and the Prandtl–Glauert singularity. In astrophysics, wherever there is evidence of shocks (standing, propagating or oscillating), the flow close by must be transonic, as only supersonic flows form shocks. All black hole accretions are transonic. Many such flows also have shocks very close to the black holes. The outflows or jets from young stellar objects or disks around black holes can also be transonic since they start subsonically and at a far distance they are invariably supersonic. Supernovae explosions are accompanied by supersonic flows and shock waves. Bow shocks formed in solar winds are a direct result of transonic winds from a star. It has been long thought that a bow shock was present around the heliosphere of our solar system. This was recently found not to be the case according to IBEX data. Look up transonic in Wiktionary, the free dictionary. ^ Chakrabarti, Sandip (1990). Theory of Transonic Astrophysical Flows. Singapore: World Scientific. ISBN 981-02-0204-0. ^ "NASA – IBEX Reveals a Missing Boundary At the Edge of the Solar System", Science daily, 2012-05-10 .